When choosing your next home improvement project, choose something that adds aesthetic appeal, functionality and value to your Perryhall home. When it comes to choosing your next home improvement project, it is important to choose something that not only adds aesthetic appeal to your Perryhall home, but also functionality and, of course, value. With that being said, one of the most affordable ways to accomplish all three is with the addition of a patio constructed with Nicolock Pavers. Nicolock is a 100% U.S. owned and operated company specializing in the production of patio pavers of every shape and size – interlocking concrete paving stones, architectural paving slabs, and precast concrete products. According to Remodeling Magazine’s annual Cost vs. Value report, a new patio has an average return on investment of 80%, making it a better investment than decking or interior remodeling. A new patio is also much more affordable. While a new deck can run you as much as $36,075 and a kitchen remodel can be as high as $112,431, a new patio comes in considerably cheaper. These pavers are made using Nicolock’s patented Paver-Shield™ technology, which is designed to protect the color of your pavers so they look great longer. The color will not fade over time. Nicolock pavers are great slip resistance, making them the ideal choice for walkways, patios, driveways and pool decks. Nicolock paving slabs are a beautiful and very cost-effective option to increase the aesthetic value and functionality of your home. Nicolock hardscape product can be recycled, as they are made from natural materials. With 40 years in the home improvement industry, Freedom Fence and Home has earned a reputation for high quality work and even higher quality customer service at an affordable rate. 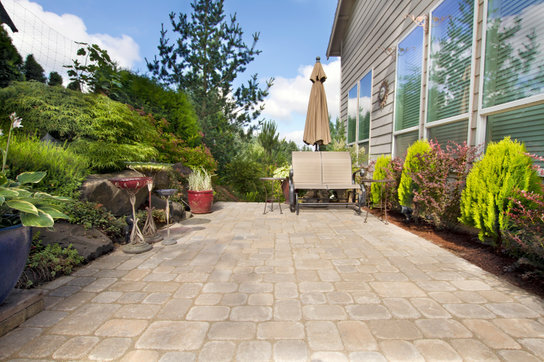 Our hardscape experts are here to help homeowners and homeowners and business owners in Perryhall and the surrounding area design a patio that will add aesthetic appeal, functionality, and value to their home for years to come. Click Here to view our patio gallery. In the meantime, if you have any questions about Nicolock Patio Pavers in Perryhall, please contact Freedom Fence and Home by calling 443-271-6841 or visit our website. You can also follow us on Facebook and Twitter! This entry was posted on Friday, July 31st, 2015	at 5:04 pm	. Both comments and pings are currently closed.